This project will train an AOSCI to implement rainwater harvesting systems, water treatment technologies and sanitation strategies with the intention of supporting the center as an income generating local hub of water education and training center. In Mozambique, poor water quality is one of the number one causes of death in young children. More than 35% of children die before the age of five, often from complications of a disease involving diarrhea, which is started by poor water quality. A Single Drop is a non-profit organization that helps create or strengthen organizations to become income-generating centers of water education and training so they can resolve their own water issues. This internationally award-winning model was developed in the Philippines providing safewater to over 26,000 people in less than 2 years and is now being introduced in Africa. AIDS Orphan Safety Center was created in 2004 by a CNN Heroes Finalist to support orphans in AIDS impacted communities by creating survival skills training programs and centers. These centers and programs empower the orphans to care for their own safety and survival. To directly impact absolute poverty by giving orphans the training necessary to stay alive; avoid accidents and injuries; minimize the impact of accidents and injuries; and provide them with income generating abilities to support themselves. AOSCI’s programs include all levels of road, fire, water, and landmine safety; animal, insect, and snake safety; water purification, filtering and cholera; sanitation and hygiene and malaria safety; new baby care, first aid, and all basic safeties including road, and train safety. The TIOS training center is already recognized for innovative strategies in health and wellness programs for children and adult trainers including its “Five Components of HIV program” TM and its “Sustainable Hut” programs. A Single Drop will be expanding the AOSCI Livelihood Programs to support and strengthen their role in the community as a Water Education and Training Center offering appropriate water technologies and strategies to support clean water access for the students as well as their surrounding community. All 1200 Children will be getting sanitaion education with the intnetion of scaling up the project next year to introduce a sanitation technology. The center plans to reach out to the community and offer WASH Education and Training. All the members of the Center will be receiving Water, Sanitation and Hygiene (WASH) Education. The goal is to mentor the youth to become a WASH task force working in the surrounding community to promote proper WASH Practices. AOSCI has a school and a farm that service 1200 orphans. The technologies that will be introduced will address water access, storage and treatment. All technologies are appropriate in that they are simple use local materials, and are replicable. Because these technologies can be replicated, it creates an income generating opportunity for the Center to offer water services in their community. Water Access - Roof Catchment for rainwater harvesting and water collection for alternative source of water. Water Storage - Ferro Cement Tanks for rainwater storage for dry season as well as supplying an alternative (and possibly safer) source of water. Ferro cement tanks can be made with simple molds made out of wire mesh and secured by chicken wire mesh, tie wire and gunny sacks. Water Filtration – BioSand Filter is a modified slow sand water filter that uses sand and gravel as the mechanism to remove pathogens from water. It differs from a normal slow sand filter in that it is smaller (1’sq and 3’tall), can be used intermittently and the sand never needs to be replaced, so once installed it requires very little maintenance as well as nearly no ongoing costs. It is proven worldwide to remove 95-98% bacteria, 100% helminthes and parasites, 90-96% iron and manganese and up to 90% viruses. These are household point-of-use devices and can be replicated and sold to the community. Water Pasteurization and Energy Conservation– Solar Ovens are used to harness the energy of the sun to cook food and pasteurize water. Select students will learn to make and use Solar CooKits out of cardboard and reflective paper. These are simple solar ovens that can be made locally and sold to the community. Water Testing - Introducing a revolutionary Portable Microbiology Lab that can be used to test water. There's no need for expensive equipment and anyone can use it, removing the mysticism of water testing. Action 1: Build a roof catchment system and ferro cement storage tank at the school with the assistance of AOSCI volunteers as well as select students. This will serve as an intro to rainwater harvesting techniques as well as the skills to build the systems for those select students. In the following months ASD will return to assist those students to replicate the Rainwater system at their farm. Action 2: Offer a BioSand Filter Training and assist the organization to build and install 20 filters throughout the city in strategic market locations to be maintained by select girls as part of AOSCI’s Rural Girls Clubs. Because the BSF will be a relatively new technology to introduce to the community, ASD will assist AOSCI to come up with a marketing strategy integrating WASH Education to create demand for the water treatment options in the community. Action 3: Transfer CooKit Solar Oven Construction Technology to introduce energy and money saving techniques for cooking as well as efficient water treatment. Action 4: ASD will be offering WASH Education throughout the training to encourage a holistic perspective on how water, sanitation and hygiene are interdependent and how to create local strategies to address them all as a whole as opposed to compartmentalizing them. Action 5: Introduction of Portable Microbiology Lab for field water testing. These new groundbreaking water tests require no expensive equipment and can be easily introduced and used by anyone. AOSCI has created a number of rural girls clubs, besides its safety school preschoolers. The local community supports the AOSCI programs as they see their children graduating as “scouts” within the community – now able to teach about proper road safety, water safety, fire safety, etc. Well safety has been a focus in the past at TIOS in respect to how children should be protected around wells and the importance of keeping the well covered, not only to protect the children, but to keep the water clean as well for everyone’s use. AOSCI works hands- on with the local regulos (or tribal chiefs) as well as the governmental chiefs (Secretary’s of the Bairros). With their assistance, children and participants are gathered who are in the most need for training assistance from our center. In the case of our “train to gain” farm it is a center where young women can learn better farming practices. The food from the farm is distributed to the other orphan projects and the livestock (chicken’s/goats, etc.) are often distributed in a pay-it-forward loan program targeted to grandmother’s with grandchildren. Although, FIPAG (from the Dutch government) has been contracted to bring water to the Chimoio communities, actual sanitation and water safety courses have not been implemented on large scale. In this manner, other NGO’s such as OSEO, World Vision and a number of community based churches have requesting this training from AIDS orphans Skills Centers for the past year as the next step to our well safety program. Water filters and training will be placed outside of the AOSCI centers as well in strategic locations such as city parks and markets for everyone to get access to safe water. This will be done under the watchful eye of our girls clubs who will do the maintenance and cleaning of these water filters bringing clean and safe water to the community. WASH Education and Strategies - Throughout the initial month-long technology transfer and business and organizational development trainings, ASD will be introducing WASH education introducing water technologies as one of the strategies to alleviate the local water issues. Capacity Building – This project will build the capacity of orphaned youth to become local water educators as well as suppliers of appropriate water technologies to address the needs of the community. Livelihood and income-generation – With the new skills and technologies that the students will learn, it will support the sustainability of the center and create a livelihood for the students. Marketing – ASD will assist the organization to use marketing strategies through water awareness and water testing to create demand in the community for the technologies offered by the AOSCI. The additional water filters will be placed strategically through out the city and the province with the ASD emblem and AOSCI emblems poured into the cement for people to know where to come for further training and assistance in preparation of safe water. AIDS Orphans Skills Centers focuses completely on survival skills training for children. The products that AOSCI makes are always geared towards making educational and wellness materials. For example our products currently include anti-bacterial and anti-itch soaps and insect repellent candles. Also, we make anatomical dolls which are having a huge impact on HIV awareness and training. Along with our safety schools we teach family law, rights and self defense to teenage girls. This project of being able to bring an income generating activity to older orphan girls who are the head of their household while bringing clean and safe water to the community is an absolute compliment to the existing curriculum at AOSCI. Nationally, and even internationally, AOSCI is becoming recognized for its impact in safety and awareness, through its innovative training programs and products. Also, AOSCI is being recognized for its emphasis on sustainable systems for youth and communities – last year the CdCAO (Creativity Center for the Support of Orphans) generated 25% of its operational cost in-country through training and programs to make the center sustainable and set an example for the children of achieving your goals through sustainable projects and management of inventory, expenses and incomes. The first choice of participants in income generating activities is always older orphan girls who are supporting younger members of their household. These are chosen based on their home-necessity as well as the number of family members they are supporting (normally about 7 people per household). ASD will help AOSCI develop a business plan that will support a $100/month maintenance savings account that can be accessed for necessary maintenance and other incidentals. Mariah Klingsmith is the Program Manager for Africa. Mariah comes to Africa from the Philippines where she was living and working for the past two years as a Water and Sanitation volunteer with the U.S. Peace Corps. She is working with grassroots women in Africa transferring appropriate technologies and assisting them to launch income-generating water service projects. Her activities in the Philippines included helping to implement a BioSand water filter project in schools and evacuation centers after two devastating typhoons and a volcano eruption ravaged her region. She has also conducted trainings in Ferro Cement water tank construction for roof catchment and spring development, BioSand filter construction and implementation and offering solid waste management education to establish a local mother’s club livelihood project using recycled materials. Gemma Bulos is the Founding Director of A Single Drop. ASD’s award-winning model for creating community based water organizations as income generating water service organizations won her the prestigious Echoing Green Fellowships honoring Social Entrepreneurs with innovative ideas for social change. She is a BioSand Filter trainer and develops water advocacy and education programs for youth to be water educators using music as a means to raise awareness. She was also been honored by Queen Latifah and Cover Girl for women changing the world through music. Her dedication to supporting women and youth to be empowered with appropriate water technologies and water education strategies brings the vision of ASD’s Uniting Communities Through Water to Africa. ASD’s most recent entrée into Africa was co-organizing and developing curriculum for the African Women and Water Conference in Nairobi, hosting grassroots women from seven countries in Africa. This conference was endorsed and attended by Wangari Maathai, Nobel Peace Laureate. ASD is supporting fifteen teams of African grassroots women to launch income-generating water service projects using appropriate water technologies. Evans Chiyenge comes from Zambia and works with SHIP, an organization that promotes and trains organizations in the BioSand filter. His expertise and experience in Africa will bring a realistic perspective on the challenges faced in Africa and how to overcome them. Amy Gillespie was born in St. Paul, MN was adopted by a family on a farm in Southern Minnesota. As an adult, she was a catastrophic loss adjuster, reconstructing homes and business after floods, tornadoes, fires, etc. in the U.S. She traveled to Mozambique where she saw a complete lack of basic safety and survival skills. As children were often orphans here or were in families diminished through the HIV pandemic - she decided to quit her job and create a program of complete survival skills so that children could keep themselves alive, keep their brothers and sisters alive -and have enough money to pay small medical things or school fees so that they could grow up and decide what they would be as adults. From there in June 2005, she formed AIDS Orphans Skills Centers and since then we have opened three orphan centers, started 3 rural girls clubs, sponsored and supported more than 20 other NGO's in training safety and income generating skills and purchased a farm to begin better agricultural practices for better living. AOSCI has created a number of innovative programs to bridge the language and educational barriers which exist in Mozambique. Last year she was nominated in the area of Champion for Children on CNN Heroes – placing in the top 15 from more than 7000 nominations. Phillipa Bore and Heather Watson are volunteers from Frontier in the U.K. Alexa Banks is from Peace Corp. U.S. and Michael Schneider is with HORIZONT3000 an organization out of Austria and from Central European Bank. Can you provide some background on the current water situation at the center and whether it serves all at the center? What is the population at AOSCI currently? Can you provide some background on the current water situation at the center and whether it serves all at the center? What is the population at AOSCI currently? Since it is a new center, it may have good water/sanitation facilities. If so, then the project could be considered for demonstration only, not satisfying an unmet need (for the center). The beneficiary numbers are 1200 and 1200 school children - are the numbers duplicated? Main question with respect to this kind of initiatives is the financial and social sustainability of the orphan center. Management and technologies seem to be rather "imported". Is the local community, the local, provincial or national authority involved in this project or in the overall set up of the Orphan Center ? If this is not the case, does the project or ASD has the idea to work on that ? How ? I hope I was able to answer most of your questions in the last paragraph. As far as AOSCI's relationship to authorities, they have conducted health HIV/AIDS awareness trainings for the local communities, larger International NGOs and Governmental agencies. Their work is recognized on a local and national level. I believe their reputation, their relationships, and their already effective model will help them to introduce these alternative technologies as viable options. Firstly, there appears to be a small error in your budget. The cost for 2 flights from Kenya to Mozambique (are they really that expensive? same as from London?) should be 2400 not 4800. Since BPR funds only drinking water component (and sanitation), please can you separate out the tools for the water system from the solar and cooking and the rest? f you are creating a 10,000liter tank, how long will the water last for how many people? If the population is 1200, then it can't last very long even in the rainy season. So you need another water source, correct? Why the 50 biosand filters - for demo, training, or for actual use? What is the model for the training? Will the filter be given away to the trainee? Too bad you could not get 2 people from the center to the African Women & Water Conference in Kenya earlier this month. Air fare - Actually, we just bought one-way tix to Beira from Nairobi and the cheapest tix are $467 OW. So RT is about $1000. For 2 people with 2 RT (one for training, one for follow-up), it's about $4000 + visas. Also included in that price is travel for the 3rd trainer from Zambia who will be delivering a 150lb biosand filter mold as well. 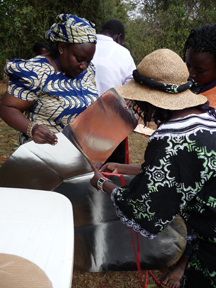 Solar cooking - we are actually introducing this technology because it is an alternative household water treatment. It is used for water pastuerization. We are absolutely committed to offering a few different options for people because we know that the biosand filter is not the most appropriate or affordable in all areas. Because our focus is to assist the center to become a center of water education, it's only reasonable that they offer alternative technologies so that everyone can choose their technology and meet everyone in the community at the level they are. Also, the costs for the solar ovens are minimal because they are simply made out of cardboard boxes, reflective material and glue. The most expensive part of the technology are WAPIs (water pastuerization indicators) and pots that need to be painted black so they can absorb the most heat. But if you think that this is not a viable household water treatment that BPR would not support, I would be happy to separate it as a line item. Water source- currently the center has one well that dries up during the dry season. They need an alternative source. 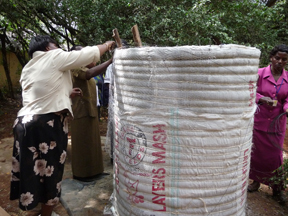 Biosand filters- the BSFs will be used as a demo in some key areas and managed by the older orphan girls. The rest will be offered to the community for purchase to support the center's entreprenuerial projects. The model for training is to teach the girls how to build and maintain them and we are scheduled for another training for local and international NGOs that are interested in the technology, and the girls will assist to strengthen their skills as facilitators. Water conference - the women who attended the conference were chosen from a very competitive pool of applicants from all over the continent. Perhaps when these young women have more experience they can compete next year. I like the idea of introducing various alternative techniques for water treatment. Pls check out www.sodis.ch for one more interesting technology. This would be cheap, reliable, and there is support from EAWAG in introducing it. Maybe a focus on water treatment could help move away from the big and expensive ferro-cement tanks - which are not quite the optimum with regard to eco-balance etc. Thanks! We are actually going to introduce the Sodis as well! We didn't put it in the budget because it doesn't require much of an expense. in the training we offer a whole workshop on how water is treated (sedimentation, filtration, disinfection etc) and the different options in the community. We want to make sure that people are offered options so that they can choose what's best for them. I like the idea of providing water testing kits. Can you share more information about these - are they locally available and affordable? Will there be training on how to use them (even easy tests require some basic training)? Yes, the water test kits are very exciting. Please contact Dr Robert Metcalf of Solar Cookers International. He has developed the Portable Microbiology Lab (PML) rmetcalf@csus.edu. they are not locally available yet, but he is very eager to share them and give presentations on how to use them. We have formed a partnership with him to have our project implementers/partners use them. Our grassroots partners are very excited because they can be the ones to show their communities that their water is dirty and the education/implementation can begin from there. A Single Drop is requesting fund from BPRF and Implementation is done by Partners. What are the challenge A single Drop face in working with partners and how do you manage to handle the challenges to make sure the project implementation is not affected? One of the greatest challenges we have seen in project implementation has been community ownership. One of the ways we find partners is through demand which is one of the best ways to know that an organization wants to own the project. AOSCI found ASD based on our work in assisting organizations to offer sustainable water technologies as a possible income-generating activity. ASDs model is not only to transfer technologies, but to offer organizational development workshops to create an action plan to ensure sustainability. AOSCI is already established in the local and national community as an income-generating center offering safety workshops and livelihood activities and their ultimate goal is to be financially and socially sustainable. They want to expand their services to address the water issues in their community and felt this was the way to do it. They have long-term foreign volunteers who will be overseeing these water projects. AOSCI has already developed a plan to implement the BioSand Filters and in the time while ASD is there, we will work with them to create a realistic implementation plan, marketing strategy and follow-up program that will help them to create demand in their community. Also during that month, we will be implementing filters into strategic locations and work on how to introduce the technology into the community. One of the key trainings that will help ensure and develop their marketing strategies and create demand is the water testing and WASH education. As far as the other technologies, we will simply be introducing them as another option for future services. The RWC and ferro cement tank will be constructed to supply the center with a safer water source and storage. The solar ovens are a complement to their bakery and cooking classes and again, are options for other services. With all the technologies, we will cover them all within the context of their relation to WASH. We focus on WASH education and reduction of water related diseases as our goal and use the technologies as a viable solution. Our partner Evans Chiyenge from our partner training organization SHIP will be available for them as needed. ASD will be available via email always and will make another visit in the new year. Last minute questions, response is NOT urgently required (not needed for rating). Is there a computer and internet at the center? Will there be someone who can interact with PWX to upload status reports? Who is going to be responsible for project management (ASD or AOSCI)? Will AOSCI expand the number of centers and carry such a program with them? Please go to the attached document of ASD AOSCI Budget and click. you will a file with attachment details, go to the download botton to download file and click in there and then another window will open where you will choose the OK botton to open the file. Its so great to see tech help coming out of Sierra Leone! I also tested it by clicking on the excel icon and it downloaded to my desktop and i was able to open the file. In future, it may be better to (additionally) contact me or help@peerwater.org for any PWX problems. I don't monitor each discussion for each application. I think it is a good project since it aims at training people that will be of help in enhancing the provision and proper care of drinking water and sanitation. The project is good but the cost of two people from Kenya is two high the need to have local expertise is important. This kind of field research with innovative and appropriate technology is interesting. Nevertheless, it needs specific capabilities and the proposal doesn't convince me that those are in place and locally driven. This project does not completely align with BPR's direction. We are supporting the AWWC conference as an experiment, and would prefer to see the results of that first. However, this is somewhat different. What has been brought up is that the project is being done by foreigners and community ownership and buy-in will happen after the rollout.